This past Saturday morning I woke up with a knot in my left leg. As the morning went on, the knot untangled itself and pain near my biopsy scar replaced the discomfort of my knot. It was Saturday. We didn’t have any particular place to be at any particular time, but this was our family day. We had plans. Hanging out on our patio. A picnic in a nearby park. An afternoon walk. And damn it, I wasn’t going to let some pain stop me. I rarely do. I can’t control when the pain hits, or where it hits, or how long the pain lasts. Certain activities (playing handball with my son, for example) are triggers. Other activities (weekly grocery shopping, for instance) sometimes aggravate my pain but not always. And rest doesn’t always help. Besides, this was Saturday. Our long-awaited family day. Our we-made-it-through-the-week, the-weather-is-beautiful, let’s-enjoy-the-day Saturday. And I wasn’t going to miss it. During our picnic lunch, I struggled to find a comfortable way to sit. Cross-legged worked for a bit. Stretching my legs straight out in front worked for a bit. No position was truly comfortable, but I tried to focus on what was most important. My son’s smile. The three of us playing Uno. The light coming through the leaves on the tree nearby. The sound of the park’s fountain. While we sat and ate and talked, my husband told me I could do my own version of a Nike commercial. Not to advertise shoes or athletic prowess, but my embodiment of their “Just Do It” theme. Because that’s what I do each day. I do what needs to be done, regardless of how I feel. 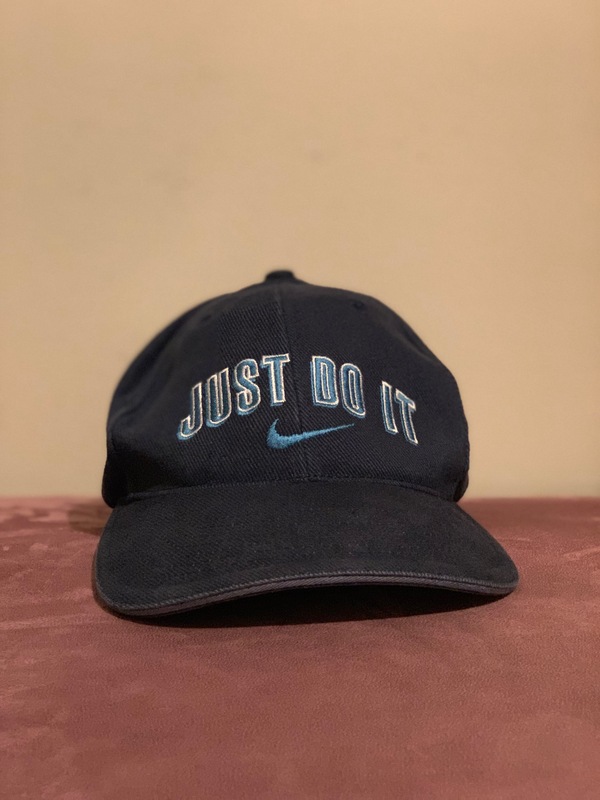 Back in my college days, I often wore a “Just Do It” cap at home during particularly stressful times. Studying for finals. Assembling a portfolio for an art class I didn’t want to take. Staying up late to complete my reading about ancient Indian history. It was my “uniform,” my buckle-down-and-do-this attire. College wasn’t easy in any sense. My husband and I moved in together and got married while I was in college. I worked throughout my college years. And for most of my college years, I relied on public transportation. (Six buses a day, 3 1/2 to 4 hours a day, for the round-trip commute from our apartment in L.A. to California State University Northridge). But I did it. I took care of what needed to be done. And I became the first in my family to earn a college degree. That Just Do It cap now hangs in my writing room. I haven’t worn it in years. I’m not sure exactly when I stopped wearing it or why. Maybe it’s because I always feel like it’s on me. it.” That’s what all of us should do every single day. Good for you for not letting anything stop you. Thank you, Luis! I appreciate it.